One of the best ice skating rinks in Boynton Beach, FL, BellaICE Skating Events.com Ice Skating Rink is a 1 sheet outdoor ice skating rink is open year round. Public Skating Ice skating sessions for All Ages are one of the main attractions at BellaICE Skating Events.com. Ice Skating provides great exercise and an opportunity to get out of the house – plus, it is not like exercising at the gym… skating is fun! Lace-em up and come join the others. Get on the ice and get ready for a great experience. If you do not see the rinks public ice skating schedule posted, be sure to contact them at (954) 445-3749 for their public session times. And please tell them that you saw them on RinkTime. And remind them to keep their schedule updated on the site. Birthday Party or Event Planning? Why not have your party or event at BellaICE Skating Events.com? They can make their rink and other facilities available to you for birthday parties, holiday parties or corporate events. Their prices are great. They would love to have you out. Give them a call if you would like to schedule your event now at (954) 445-3749. Please call at least one week in advance to properly schedule your event. Visit our Pro Shop If your are looking for new ice hockey, figure and other skating equipment or services, BellaICE Skating Events.com can help. The BellaICE Skating Events.com pro shop offers a wide array of products and services. Stop by for a visit next time you are at the rink or contact them now at (954) 445-3749 to see if they have what you are looking for. Palm Beach Ice Works Ice Skating Rink is a 1 sheet indoor ice skating rink that is open year round. Ice skating sessions for All Ages are availble at Palm Beach Ice Works. One of the best ice skating rinks in West Palm Beach, FL, Palm Beach Ice Works Ice Skating Rink is a 1 sheet indoor ice skating rink is open year round. Public Skating Ice skating sessions for All Ages are one of the main attractions at Palm Beach Ice Works. Ice Skating provides great exercise and an opportunity to get out of the house – plus, it is not like exercising at the gym… skating is fun! Lace-em up and come join the others. Get on the ice and get ready for a great experience. If you do not see the rinks public ice skating schedule posted, be sure to contact them at (561) 656-4046 for their public session times. And please tell them that you saw them on RinkTime. And remind them to keep their schedule updated on the site. One of the best ice skating rinks in Sarasota, FL, Sarasota Square Mall Ice Skating Rink is a 1 sheet indoor ice skating rink is open year round. Public Skating Ice skating sessions for All Ages are one of the main attractions at Sarasota Square Mall. Ice Skating provides great exercise and an opportunity to get out of the house – plus, it is not like exercising at the gym… skating is fun! Lace-em up and come join the others. Get on the ice and get ready for a great experience. If you do not see the rinks public ice skating schedule posted, be sure to contact them at (941) 554-6078 for their public session times. And please tell them that you saw them on RinkTime. And remind them to keep their schedule updated on the site. Ice Hockey Leagues Sarasota Square Mall Ice Skating Rink offers ice hockey leagues for all ages. Whether you are a beginning skater looking to play on a team in an instructional league or an experienced ice hockey player looking to get out and play with others of a similar caliber, Sarasota Square Mall Ice Skating Rink is the place to play. Give them a call at (941) 554-6078 to inquire about their leagues now. The experienced group will help get you ready for your next game Leagues and levels include: Adult,Youth. One of the best ice skating rinks in Miami Beach, FL, Scott Rakow Youth Center Ice Skating Rink is a 1 sheet indoor ice skating rink is open year round. Public Skating Ice skating sessions for All Ages are one of the main attractions at Scott Rakow Youth Center. Ice Skating provides great exercise and an opportunity to get out of the house – plus, it is not like exercising at the gym… skating is fun! Lace-em up and come join the others. Get on the ice and get ready for a great experience. If you do not see the rinks public ice skating schedule posted, be sure to contact them at (305) 604-4823 for their public session times. And please tell them that you saw them on RinkTime. And remind them to keep their schedule updated on the site. Figure & Ice Skating Lessons. Are you an adult looking to learn to ice skate? 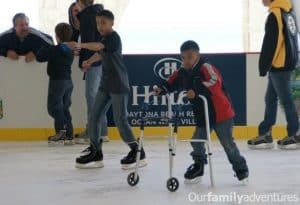 Do you have children yearning to ice skate like the pros? If so, the folks here love to teach and their instructors are top notch. For beginners they usually focus on providing the basics. For more advanced skaters they focus on proper form, technique and getting you ready to meet your goals. Call Scott Rakow Youth Center at (305) 604-4823 for more details. Ice Hockey Leagues Scott Rakow Youth Center Ice Skating Rink offers ice hockey leagues for youths. Whether you are a beginning skater looking to play on a team in an instructional league or an experienced ice hockey player looking to get out and play with others of a similar caliber, Scott Rakow Youth Center Ice Skating Rink is the place to play. Give them a call at (305) 604-4823 to inquire about their leagues now. The experienced group will help get you ready for your next game Leagues and levels include: Youth. Ice Hockey Tournaments What better way to see how you and your team stacks up than to play against teams outside your normal leagues? Scott Rakow Youth Center Ice Skating Rink hosts ice hockey tournaments foryouths.at their facilities. Call Scott Rakow Youth Center at (305) 604-4823 for more details and to look into upcoming tournaments. Ice Hockey Camps and Clinics With the exception of private lessons, the best way to increase your hockey skills is to do drills and exercises that build on the fundamentals. Even better is to do those drills while supervised by someone who understands how to do things properly and can correct you when you are doing them wrong. When playing, everyone feels like they are NHL ready, but very few really look or play that way. Scott Rakow Youth Center Ice Skating Rink offers camps and clinics for youths.to help you improve your game. Call Scott Rakow Youth Center at (305) 604-4823 to learn when their next ice hockey camp or clinic is being held. Pickup Hockey on Ice Looking for a casual game of hockey? Scott Rakow Youth Center Ice Skating Rink offers pickup ice hockey for youths.Give Scott Rakow Youth Center a call at (305) 604-4823 to inquire about their pickup hockey schedule if it is not listed in the description or schedule here. Birthday Party or Event Planning? Why not have your party or event at Scott Rakow Youth Center? They can make their rink and other facilities available to you for birthday parties, holiday parties or corporate events. Their prices are great. They would love to have you out. Give them a call if you would like to schedule your event now at (305) 604-4823. Please call at least one week in advance to properly schedule your event. Snack Bar Got the munchies? Scott Rakow Youth Center provides food and beverages in the snack bar. One of the best ice skating rinks in Pompano Beach, FL, Glacier Ice and Snow Arena Ice Skating Rink is a 1 sheet indoor ice skating rink is open year round. Public Skating Ice skating sessions for All Ages are one of the main attractions at Glacier Ice and Snow Arena. Ice Skating provides great exercise and an opportunity to get out of the house – plus, it is not like exercising at the gym… skating is fun! Lace-em up and come join the others. Get on the ice and get ready for a great experience. If you do not see the rinks public ice skating schedule posted, be sure to contact them at (954) 943-1437 for their public session times. And please tell them that you saw them on RinkTime. And remind them to keep their schedule updated on the site. Figure & Ice Skating Lessons. Are you an adult looking to learn to ice skate? Do you have children yearning to ice skate like the pros? If so, the folks here love to teach and their instructors are top notch. For beginners they usually focus on providing the basics. For more advanced skaters they focus on proper form, technique and getting you ready to meet your goals. Call Glacier Ice and Snow Arena at (954) 943-1437 for more details. Ice Hockey Leagues Glacier Ice and Snow Arena Ice Skating Rink offers ice hockey leagues for all ages. Whether you are a beginning skater looking to play on a team in an instructional league or an experienced ice hockey player looking to get out and play with others of a similar caliber, Glacier Ice and Snow Arena Ice Skating Rink is the place to play. Give them a call at (954) 943-1437 to inquire about their leagues now. The experienced group will help get you ready for your next game Leagues and levels include: Adult,Youth,Middle School,High School,Collegiate. Ice Hockey Tournaments What better way to see how you and your team stacks up than to play against teams outside your normal leagues? Glacier Ice and Snow Arena Ice Skating Rink hosts ice hockey tournaments forall ages.at their facilities. Call Glacier Ice and Snow Arena at (954) 943-1437 for more details and to look into upcoming tournaments. Ice Hockey Camps and Clinics With the exception of private lessons, the best way to increase your hockey skills is to do drills and exercises that build on the fundamentals. Even better is to do those drills while supervised by someone who understands how to do things properly and can correct you when you are doing them wrong. When playing, everyone feels like they are NHL ready, but very few really look or play that way. Glacier Ice and Snow Arena Ice Skating Rink offers camps and clinics for all ages.to help you improve your game. Call Glacier Ice and Snow Arena at (954) 943-1437 to learn when their next ice hockey camp or clinic is being held. Pickup Hockey on Ice Looking for a casual game of hockey? Glacier Ice and Snow Arena Ice Skating Rink offers pickup ice hockey for all ages.Give Glacier Ice and Snow Arena a call at (954) 943-1437 to inquire about their pickup hockey schedule if it is not listed in the description or schedule here. Broom Ball Glacier Ice and Snow Arena offers Broomball. Many people do not know this, but Broomball is an actual competitive sport. It is similar to ice hockey – it is fast and fun. If you are looking to rent the ice for a group to play broomball or you are just interested in giving it a try, give them a call now at (954) 943-1437. Birthday Party or Event Planning? Why not have your party or event at Glacier Ice and Snow Arena? They can make their rink and other facilities available to you for birthday parties, holiday parties or corporate events. Their prices are great. They would love to have you out. Give them a call if you would like to schedule your event now at (954) 943-1437. Please call at least one week in advance to properly schedule your event. Snack Bar Got the munchies? Glacier Ice and Snow Arena provides food and beverages in the snack bar. Visit our Pro Shop If your are looking for new ice hockey, figure and other skating equipment or services, Glacier Ice and Snow Arena can help. The Glacier Ice and Snow Arena pro shop offers a wide array of products and services. Stop by for a visit next time you are at the rink or contact them now at (954) 943-1437 to see if they have what you are looking for. One of the best ice skating rinks in Pensacola, FL, Pensacola Bay Center Ice Skating Rink is a 1 sheet indoor ice skating rink is open year round. Public Skating Ice skating sessions for All Ages are one of the main attractions at Pensacola Bay Center. Ice Skating provides great exercise and an opportunity to get out of the house – plus, it is not like exercising at the gym… skating is fun! Lace-em up and come join the others. Get on the ice and get ready for a great experience. If you do not see the rinks public ice skating schedule posted, be sure to contact them at +1-850-432-0800 for their public session times. And please tell them that you saw them on RinkTime. And remind them to keep their schedule updated on the site. Figure & Ice Skating Lessons. Are you an adult looking to learn to ice skate? 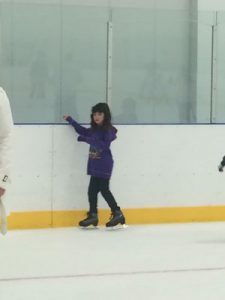 Do you have children yearning to ice skate like the pros? If so, the folks here love to teach and their instructors are top notch. For beginners they usually focus on providing the basics. For more advanced skaters they focus on proper form, technique and getting you ready to meet your goals. Call Pensacola Bay Center at +1-850-432-0800 for more details. Ice Hockey Leagues Pensacola Bay Center Ice Skating Rink offers ice hockey leagues for all ages. Whether you are a beginning skater looking to play on a team in an instructional league or an experienced ice hockey player looking to get out and play with others of a similar caliber, Pensacola Bay Center Ice Skating Rink is the place to play. Give them a call at +1-850-432-0800 to inquire about their leagues now. The experienced group will help get you ready for your next game Leagues and levels include: Adult,Youth. Ice Hockey Tournaments What better way to see how you and your team stacks up than to play against teams outside your normal leagues? Pensacola Bay Center Ice Skating Rink hosts ice hockey tournaments forall ages.at their facilities. Call Pensacola Bay Center at +1-850-432-0800 for more details and to look into upcoming tournaments. Birthday Party or Event Planning? Why not have your party or event at Pensacola Bay Center? They can make their rink and other facilities available to you for birthday parties, holiday parties or corporate events. Their prices are great. They would love to have you out. Give them a call if you would like to schedule your event now at +1-850-432-0800. Please call at least one week in advance to properly schedule your event. Snack Bar Got the munchies? Pensacola Bay Center provides food and beverages in the snack bar. Visit our Pro Shop If your are looking for new ice hockey, figure and other skating equipment or services, Pensacola Bay Center can help. The Pensacola Bay Center pro shop offers a wide array of products and services. Stop by for a visit next time you are at the rink or contact them now at +1-850-432-0800 to see if they have what you are looking for. One of the best ice skating rinks in Daytona Beach, FL, Daytona Ice Arena Ice Skating Rink is a 1 sheet indoor ice skating rink is open year round. Public Skating Ice skating sessions for All Ages are one of the main attractions at Daytona Ice Arena. Ice Skating provides great exercise and an opportunity to get out of the house – plus, it is not like exercising at the gym… skating is fun! Lace-em up and come join the others. Get on the ice and get ready for a great experience. If you do not see the rinks public ice skating schedule posted, be sure to contact them at +1-386-322-4848 for their public session times. And please tell them that you saw them on RinkTime. And remind them to keep their schedule updated on the site. Figure & Ice Skating Lessons. Are you an adult looking to learn to ice skate? Do you have children yearning to ice skate like the pros? If so, the folks here love to teach and their instructors are top notch. For beginners they usually focus on providing the basics. For more advanced skaters they focus on proper form, technique and getting you ready to meet your goals. Call Daytona Ice Arena at +1-386-322-4848 for more details. Ice Hockey Leagues Daytona Ice Arena Ice Skating Rink offers ice hockey leagues for all ages. Whether you are a beginning skater looking to play on a team in an instructional league or an experienced ice hockey player looking to get out and play with others of a similar caliber, Daytona Ice Arena Ice Skating Rink is the place to play. Give them a call at +1-386-322-4848 to inquire about their leagues now. The experienced group will help get you ready for your next game Leagues and levels include: Adult,Youth,Mini Mite,Mite,Squirt,Peewee,Collegiate. Ice Hockey Tournaments What better way to see how you and your team stacks up than to play against teams outside your normal leagues? Daytona Ice Arena Ice Skating Rink hosts ice hockey tournaments forall ages.at their facilities. Call Daytona Ice Arena at +1-386-322-4848 for more details and to look into upcoming tournaments. Ice Hockey Camps and Clinics With the exception of private lessons, the best way to increase your hockey skills is to do drills and exercises that build on the fundamentals. Even better is to do those drills while supervised by someone who understands how to do things properly and can correct you when you are doing them wrong. When playing, everyone feels like they are NHL ready, but very few really look or play that way. Daytona Ice Arena Ice Skating Rink offers camps and clinics for all ages.to help you improve your game. Call Daytona Ice Arena at +1-386-322-4848 to learn when their next ice hockey camp or clinic is being held. Pickup Hockey on Ice Looking for a casual game of hockey? Daytona Ice Arena Ice Skating Rink offers pickup ice hockey for all ages.Give Daytona Ice Arena a call at +1-386-322-4848 to inquire about their pickup hockey schedule if it is not listed in the description or schedule here. Speed Skating Some say going round in circles is boring – others feel the thrill of flying around on the ice at twenty to nearly forty miles per hour and find it exhilarating. Speed Skating is fast, requires strength, skill, talent and concentration. 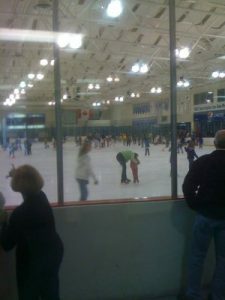 Daytona Ice Arena provides speed skating for all ages.facilities with very fast ice. Broom Ball Daytona Ice Arena offers Broomball. Many people do not know this, but Broomball is an actual competitive sport. It is similar to ice hockey – it is fast and fun. If you are looking to rent the ice for a group to play broomball or you are just interested in giving it a try, give them a call now at +1-386-322-4848. Birthday Party or Event Planning? Why not have your party or event at Daytona Ice Arena? They can make their rink and other facilities available to you for birthday parties, holiday parties or corporate events. Their prices are great. They would love to have you out. 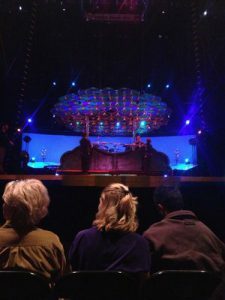 Give them a call if you would like to schedule your event now at +1-386-322-4848. Please call at least one week in advance to properly schedule your event. Snack Bar Got the munchies? Daytona Ice Arena provides food and beverages in the snack bar. Visit our Pro Shop If your are looking for new ice hockey, figure and other skating equipment or services, Daytona Ice Arena can help. The Daytona Ice Arena pro shop offers a wide array of products and services. Stop by for a visit next time you are at the rink or contact them now at +1-386-322-4848 to see if they have what you are looking for. One of the best ice skating rinks in Miami, FL, Kendall Ice Arena Ice Skating Rink is a 2 sheet indoor ice skating rink is open year round. It was founded in 2000. Public Skating Ice skating sessions for All Ages are one of the main attractions at Kendall Ice Arena. Ice Skating provides great exercise and an opportunity to get out of the house – plus, it is not like exercising at the gym… skating is fun! Lace-em up and come join the others. Get on the ice and get ready for a great experience. If you do not see the rinks public ice skating schedule posted, be sure to contact them at (305) 386-8288 for their public session times. And please tell them that you saw them on RinkTime. And remind them to keep their schedule updated on the site. Figure & Ice Skating Lessons. Are you an adult looking to learn to ice skate? Do you have children yearning to ice skate like the pros? If so, the folks here love to teach and their instructors are top notch. For beginners they usually focus on providing the basics. For more advanced skaters they focus on proper form, technique and getting you ready to meet your goals. Call Kendall Ice Arena at (305) 386-8288 for more details. Ice Hockey Leagues Kendall Ice Arena Ice Skating Rink offers ice hockey leagues for all ages. 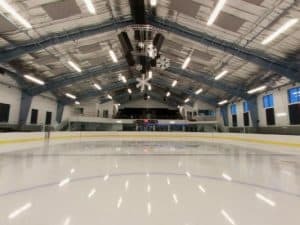 Whether you are a beginning skater looking to play on a team in an instructional league or an experienced ice hockey player looking to get out and play with others of a similar caliber, Kendall Ice Arena Ice Skating Rink is the place to play. Give them a call at (305) 386-8288 to inquire about their leagues now. The experienced group will help get you ready for your next game Leagues and levels include: Adult,Youth. Ice Hockey Tournaments What better way to see how you and your team stacks up than to play against teams outside your normal leagues? Kendall Ice Arena Ice Skating Rink hosts ice hockey tournaments forall ages.at their facilities. Call Kendall Ice Arena at (305) 386-8288 for more details and to look into upcoming tournaments. Ice Hockey Camps and Clinics With the exception of private lessons, the best way to increase your hockey skills is to do drills and exercises that build on the fundamentals. Even better is to do those drills while supervised by someone who understands how to do things properly and can correct you when you are doing them wrong. When playing, everyone feels like they are NHL ready, but very few really look or play that way. Kendall Ice Arena Ice Skating Rink offers camps and clinics for all ages.to help you improve your game. Call Kendall Ice Arena at (305) 386-8288 to learn when their next ice hockey camp or clinic is being held. Pickup Hockey on Ice Looking for a casual game of hockey? Kendall Ice Arena Ice Skating Rink offers pickup ice hockey for all ages.Give Kendall Ice Arena a call at (305) 386-8288 to inquire about their pickup hockey schedule if it is not listed in the description or schedule here. Speed Skating Some say going round in circles is boring – others feel the thrill of flying around on the ice at twenty to nearly forty miles per hour and find it exhilarating. Speed Skating is fast, requires strength, skill, talent and concentration. Kendall Ice Arena provides speed skating for all ages.facilities with very fast ice. Broom Ball Kendall Ice Arena offers Broomball. Many people do not know this, but Broomball is an actual competitive sport. It is similar to ice hockey – it is fast and fun. If you are looking to rent the ice for a group to play broomball or you are just interested in giving it a try, give them a call now at (305) 386-8288. Birthday Party or Event Planning? Why not have your party or event at Kendall Ice Arena? They can make their rink and other facilities available to you for birthday parties, holiday parties or corporate events. Their prices are great. They would love to have you out. Give them a call if you would like to schedule your event now at (305) 386-8288. Please call at least one week in advance to properly schedule your event. Snack Bar Got the munchies? Kendall Ice Arena provides food and beverages in the snack bar. Visit our Pro Shop If your are looking for new ice hockey, figure and other skating equipment or services, Kendall Ice Arena can help. The Kendall Ice Arena pro shop offers a wide array of products and services. Stop by for a visit next time you are at the rink or contact them now at (305) 386-8288 to see if they have what you are looking for. One of the best ice skating rinks in Jacksonville, FL, Jacksonville Ice and Sportsplex Ice Skating Rink is a 1 sheet indoor ice skating rink is open year round. It was founded in 1992. Public Skating Ice skating sessions for All Ages are one of the main attractions at Jacksonville Ice and Sportsplex. Ice Skating provides great exercise and an opportunity to get out of the house – plus, it is not like exercising at the gym… skating is fun! Lace-em up and come join the others. Get on the ice and get ready for a great experience. If you do not see the rinks public ice skating schedule posted, be sure to contact them at (904) 399-3223 for their public session times. And please tell them that you saw them on RinkTime. And remind them to keep their schedule updated on the site. Figure & Ice Skating Lessons. Are you an adult looking to learn to ice skate? Do you have children yearning to ice skate like the pros? If so, the folks here love to teach and their instructors are top notch. For beginners they usually focus on providing the basics. For more advanced skaters they focus on proper form, technique and getting you ready to meet your goals. Call Jacksonville Ice and Sportsplex at (904) 399-3223 for more details. Ice Hockey Leagues Jacksonville Ice and Sportsplex Ice Skating Rink offers ice hockey leagues for all ages. Whether you are a beginning skater looking to play on a team in an instructional league or an experienced ice hockey player looking to get out and play with others of a similar caliber, Jacksonville Ice and Sportsplex Ice Skating Rink is the place to play. Give them a call at (904) 399-3223 to inquire about their leagues now. The experienced group will help get you ready for your next game Leagues and levels include: Adult,Youth,Mite,Squirt,Peewee,Bantam,Midget. Ice Hockey Tournaments What better way to see how you and your team stacks up than to play against teams outside your normal leagues? Jacksonville Ice and Sportsplex Ice Skating Rink hosts ice hockey tournaments forall ages.at their facilities. Call Jacksonville Ice and Sportsplex at (904) 399-3223 for more details and to look into upcoming tournaments. Ice Hockey Camps and Clinics With the exception of private lessons, the best way to increase your hockey skills is to do drills and exercises that build on the fundamentals. Even better is to do those drills while supervised by someone who understands how to do things properly and can correct you when you are doing them wrong. When playing, everyone feels like they are NHL ready, but very few really look or play that way. Jacksonville Ice and Sportsplex Ice Skating Rink offers camps and clinics for all ages.to help you improve your game. Call Jacksonville Ice and Sportsplex at (904) 399-3223 to learn when their next ice hockey camp or clinic is being held. Pickup Hockey on Ice Looking for a casual game of hockey? Jacksonville Ice and Sportsplex Ice Skating Rink offers pickup ice hockey for all ages.Give Jacksonville Ice and Sportsplex a call at (904) 399-3223 to inquire about their pickup hockey schedule if it is not listed in the description or schedule here. Broom Ball Jacksonville Ice and Sportsplex offers Broomball. Many people do not know this, but Broomball is an actual competitive sport. It is similar to ice hockey – it is fast and fun. If you are looking to rent the ice for a group to play broomball or you are just interested in giving it a try, give them a call now at (904) 399-3223. Birthday Party or Event Planning? Why not have your party or event at Jacksonville Ice and Sportsplex? They can make their rink and other facilities available to you for birthday parties, holiday parties or corporate events. Their prices are great. They would love to have you out. Give them a call if you would like to schedule your event now at (904) 399-3223. Please call at least one week in advance to properly schedule your event. Snack Bar Got the munchies? Jacksonville Ice and Sportsplex provides food and beverages in the snack bar. Visit our Pro Shop If your are looking for new ice hockey, figure and other skating equipment or services, Jacksonville Ice and Sportsplex can help. The Jacksonville Ice and Sportsplex pro shop offers a wide array of products and services. Stop by for a visit next time you are at the rink or contact them now at (904) 399-3223 to see if they have what you are looking for.